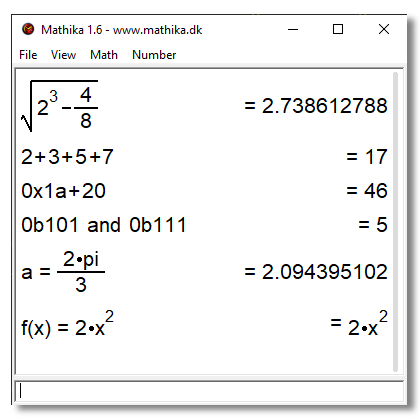 Mathika is a calculator, which can be used as a replacement for the Windows Calculator and is easy to use. Available on multiple platforms. It is free and can be downloaded here. Shows the entire input calculation in a graphical display, to make it easier to check if numbers were typed correctly. Previously typed formulas or results can be fetched from the output window and edited. Use the 4 cursor keys to navigate. Realtime updating of the result while typing. This means it is not neccesary to press return, when one wants to see an intermediate result. Works for both Mac OS-X and Windows XP! Both version are available for download. If you got the time please be free to drop me a note and tell how you like the program. Thanks to David Filskov for feedback and suggestions and thanks to Jonas Raagaard for the new Mathika icon. In general, type in the formula in the bottom edit box, and press "enter". The result will then be displayed it the result box above. As the formula is typed Mathika will try to compute the result which is shown as the bottom most result in the result box. If the formula is parsed correctly it will be written in black, else the last valid result will be written in grey, to indicate something is wrong. One can edit earlier typed in formulas, by using the cursor arrow keys to select either an earlier result or an earlier formula. When the desired result or formula is highlighted, press "enter" the put the highlighted expression into the edit box. Numbers can be typed as integers or numbers with comma. 10 base exponent can be given using the symbol e in the number (only decimal numbers). Numbers can at any time be typed in either decimal, hexadecimal or binary. Computes the squareroot of the expression. Computes the arcsine of the expression. Computes the arccosine of the expression. Computes the arctangent of the expression. Computes the base 10 logarithm of the expression. Computes the base 2 logarithm of the expression. Computes the base 16 logarithm of the expression. Computes the natural logarithm (base e) of the expression. Mathika is under constant development and a number of new features is already planned. If you have any ideas for changes or new features please write me. Below a list of planned features to come. The list is in prioritized order. Added scrollbar when formulas and calculations exceeds the height of the window. Supports scrolling using cursor keys and mouse. Ignoring underscore '_' in hexadecimal and binary input to help user. Example: 0b1111_1010 and 0x45a3_1234_cc34 are now legal inputs. Implemented thousands separator (thin space). Implemented delete of selected entries using Delete button. Mostly internal updates of code. OS-X version now fully up to date. Added sind, cosd and tand functions for evaluating trigonometric functions with degrees as input instead of radians. Fixed bug in visualization of paranthesis in subtractions. Result were correct but view on screen would lack paranthesis in some cases. Example 3-(2+1) would be viewed as 3-2+1, but result was correctly computed as 0. Added mixed view. Which displays numbers in the base (decimal, hex or binary) as they were input by user. Made a "Save Settings" menu item, instead of saving automatically when closing Mathika. This fixes a problem that caused position and size to be abnormal if Mathika was closed while minimized. Fixed an emberrassing bug that caused negative results to be displayed as positive numbers in binary and hexadecimal mode. Added colour settings to ini file. To edit colours this has to be edited manually in the ini file though. Fixed problem with storage of position in ini file, when position is negative (can happen when using dual monitor). Fixed bug that caused the edit line to be deactivated when clicking on history window. The edit line is now always active. Implemented graphical rendering (pretty print) of squareroots. Adjusted graphical parameters to make graphical rendering look nicer and to make elements be better positioned. Changed multiply from * to dot (more mathematical like). Text size can now be modified using Ctrl+1 and Ctrl+2. Size is stored in ini file. Added view menu item changing text size. Added number menu for showing different rounding functions. Added rounding functions; ceil, floor and round. Improved pretty print, so eg. powers and ratios align better on each line. Fixed ratio printing such that eg. 1/2/3 is distinguisable from 1/(2/3). Fixed bug where 'z' was interpreted as Undo. Fixed problem with infinity and NaN (Not a number), in hexadecimal and binary output mode. Values like 1/0 was previously outputted wrong i hex and binary mode but are now written as "+infinity". Added binary and hexadecimal output-modes. Select Normal decimal mode with either F5 or CTRL+N. Select Hexadecimal mode with either F6 or CTRL+H. Select Binary mode with either F7 or CTRL+B. Fixed bug that caused already typed formulas like 2/(3*5) to be reinterpreted wrong when inserted back into edit box. Removed dependency on msvcp71.dll which caused some users not to be able to run Mathika. Added new icon from Jonas Raagaard. Added constant e (the natural number). Fixed minor problem with height of empty expr field. Added variables. The user can now store results in a variable and use that variable as a number in the calculations. Implemented insert function, so previous results now are inserted into the edit-text instead of replacing it. Removed annoying flicker on screen, when window was updated or resized. Fixed bug that caused Mathika to crash if the ini file did exist but had size zero. Disabled tab to avoid tabbing focus away from edit window. Mathika will now remember its window size also. Fixed bug that caused Mathika to crash if the ini file was write protected. Mathika will now remember its last screen position IF a file named mathika.ini is placed together with the Mathika .exe file. The file may be empty, it will be overwritten next time Mathika is closed. Shift + Enter will now set paranthesis around the previous text. Major changes internal in the makefiles and project settings, but irrelevant for the user. Holding ctrl down and pressing either * or / on the numeric keyboard, will now set paranthesis around the previous text. If current result is invalid it will now be colored grey, to indicate this.